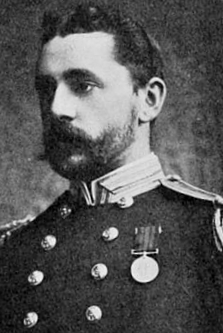 I was spurred to research and write this article by reading the memoirs of the great Royal Navy gunnery expert of the pre-World War period, Admiral Sir Percy Scott (1853-1924) who as a young officer played a peripheral role in the story. I will quote directly from him later in this article. (See photograph on right – Scott as a captain in mid-career). HMS Sultan was of 9290 tons and 325 feet long. A single-shaft 7720 HP engine drove her at a maximum 14 knots under steam but could only make 6 knots under sail. She was designed to carry her guns in a centrally-placed armoured-box battery, as will be seen in the contemporary diagram below which shows the battery’s two levels. The armament consisted of eight 10-inch and four 9-inch rifled muzzle-loaders. The weapons on the main deck guns provided broadside fire, with limited ahead fire from the foremost gun on each side, while those on the upper deck provided additional broadside fire and also could fire astern, by traversing the after gun on a turntable. Side armour – as seen in blue on the diagram below – was up to 9 inches thick. The ship, and her armour, were all of iron as steel was not yet the preferred construction material. 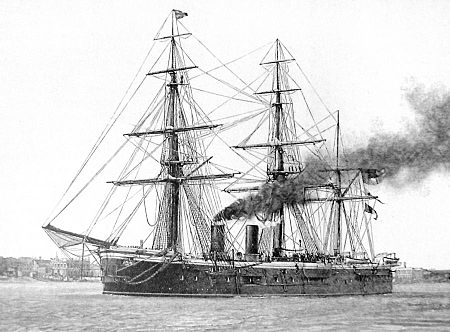 HMS Sultan was indeed to be of service of the Ottoman Empire, but after the death of Abdülaziz. This service occurred in early 1878 when the Sultan was part of British Squadron which moored off Istanbul at the moment, at the end of the 1877-78 Russo-Turkish War, when the victorious Russian armies had reached the city’s suburbs and were about to enter. This was unacceptable for Britain and the presence of the Royal Navy squadron showed determination to go to war with Russia to prevent it. Thus confronted, the Russians backed down and peace was made with the Ottomans. 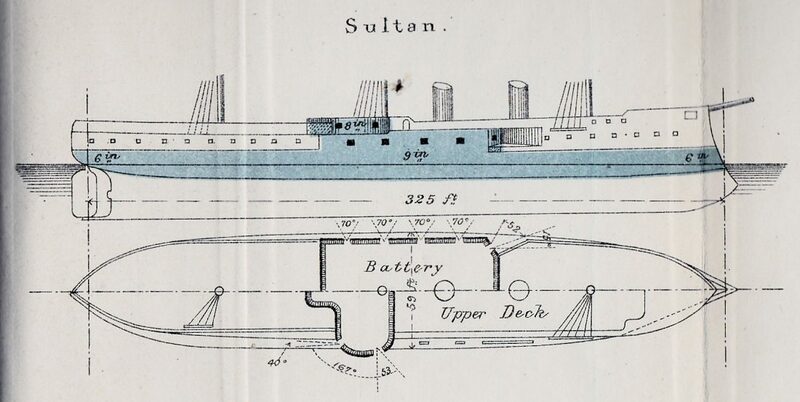 Much of the Sultan’s active service was to be in the Mediterranean and in 1882 she was to participate in the bombardment of Alexandria, sustaining casualties of two killed and eight wounded from a single hit on her battery. 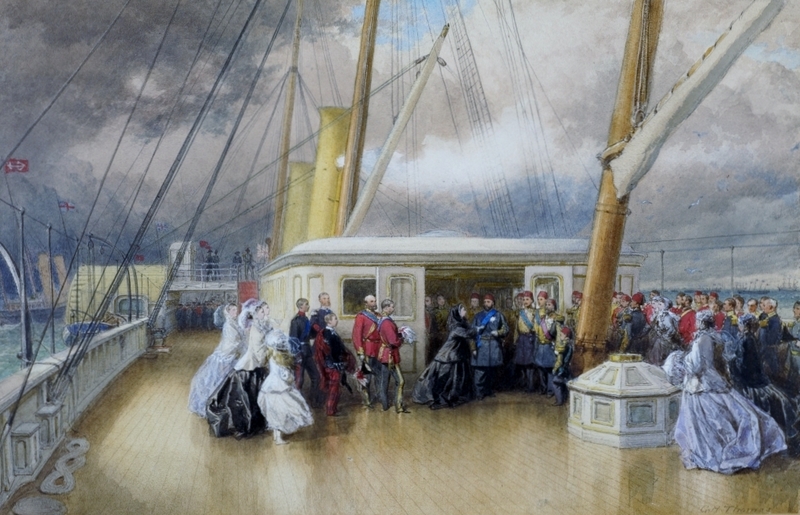 It was on the 6th March, 1889, that H.M.S. Sultan, while practising firing torpedoes, struck on a rock in the Comino Channel. 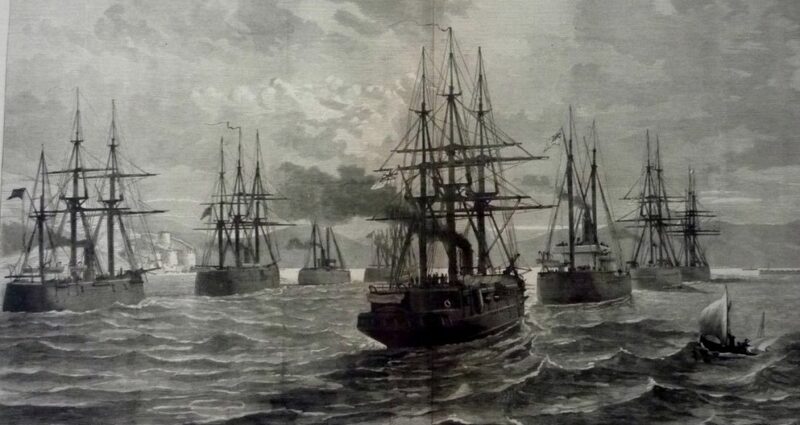 Every endeavour to tow her off failed, and seven days afterwards, during a northerly gale, she was washed off the rock and sank in 42 feet of water. An examination of the hull of the vessel by divers revealed that the damages sustained were so excessive that all hope of getting her up was abandoned. The Admiralty offered £50,000 to anyone who would raise her and bring her into a harbour, but the representatives of two or three firms who had a look at her agreed in regarding the task as impossible. Speculation was rife as to how many men-of-war M. Chambon would require to assist him, and how much plant he would bring. He required no help, and arrived in a tiny steamer called the Utile, with a total crew of twelve, six of whom were divers. The only plant he brought was brains. He started work on the 24th June by cautiously blasting away such rocks as were too close to- the ship’s side to enable the work to be undertaken on the holes that had been discovered. The task of closing up the larger fractures in the ship’s bottom was then begun and one by one the holes were sealed up in the- following ingenious manner. 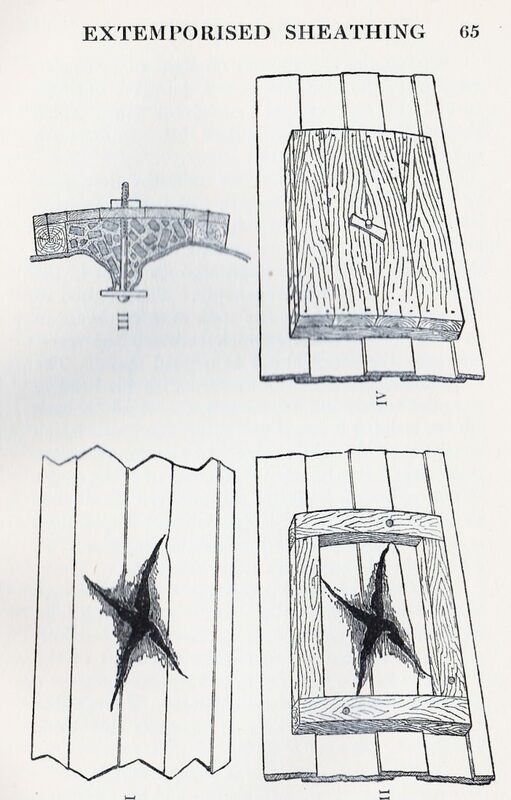 From templates taken by the divers of the curvature of the ship’s bottom in the vicinity of the hole, a wooden frame was prepared. This was sent down, and the divers secured it round the hole. Across this frame planks were nailed, and as each plank was put in its, place, the space between it and the plating was -filled in with a mixture of bricks, mortar, and cement, and thus a solid sheathing was formed over the hole. The excellence of this work can be seen from the pictures on the opposite page (reproduced above); it was a master-piece of diving skill. Meanwhile the work of making watertight the upper deck, including hatchways, ports, and ventilators, was proceeded with, and the various pumps put on board by the dockyard were got ready for pumping her out. At the end of a month, on the 27th July, all the holes were sealed up, the pumps were started, and the ship was lifted. Unfortunately a gale of wind sprang up. The Sultan sank again and in striking the bottom, did more damage to the hull. This disheartening occurrence only strengthened M. Chambon’s indomitable energy. Directly the weather moderated, the divers went down, repaired the hull and on the 17th August the pumps were started and the Sultan floated. Then followed catastrophe number two. While she was being moved, the ship was caught by the current and knocked up against a rock, displacing a patch. She filled, and sank for the third time. The reports of the divers as to the extent of the damage done by this third sinking were very discouraging; but nothing would deter M. Chambon from completing his work. Renewed energy was put into it, and, nine days afterwards, on the 26th August, the Sultan was up again and towed into Malta harbour. I was in charge of a large party of men from the Edinburgh to assist in docking and clearing her. The ship must have been splendidly built. After sinking three times and being on the bottom for six months, she showed no signs of structural weakness. As the water was pumped out, we turned the engines and trained the guns, which showed she was not out of line. In a month or two she steamed home. This superb achievement was only made possible by the availability of Standard Diving Dress, which was cutting edge technology of the time. 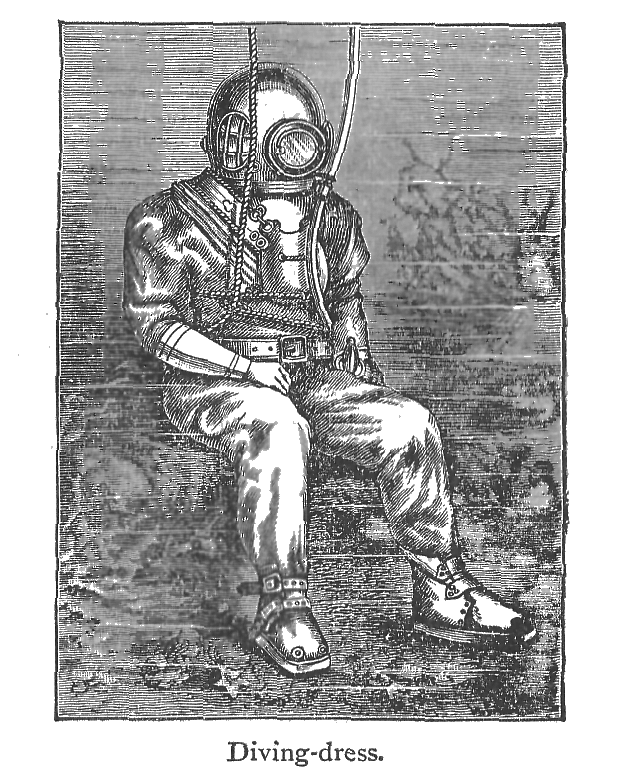 The techniques employed were innovative at the time and were to become standard in the salvage industry thereafter. 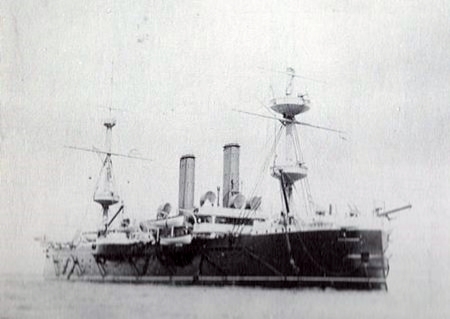 After arriving back in Portsmouth the Sultan underwent modernisation and repair, at a rather leisurely rate, until 1896, losing her masts and yards in the process. Of little fighting capability she stayed in reserve to 1906. Scott’s remark that the Sultan “must have been splendidly built” appeared in his memoirs in 1919. By then her large and robust hull had been used, under different names, as an artificers’ training ship and as a mechanical repair ship. When Scott wrote she still had over a quarter-century’s service ahead of her as she was to be employed as a depot ship for minesweepers at Portsmouth during World War 2, being finally scrapped until in 1947. 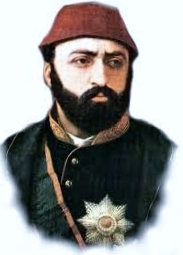 And what of Sultan Abdülaziz? His passion for modernisation led to mounting public debt and he was deposed by his ministers on May 30th 1876. He was dead five days later, allegedly by suicide. The method reported – getting hold of scissors in his tower prison cell and managing to cut his two wrists at once – sounded unlikely in the extreme and it was widely believed that he had been murdered. The ship named in his honour was to outlive this tragic figure by seventy-one years.